Hunter Walsh was zoned in. 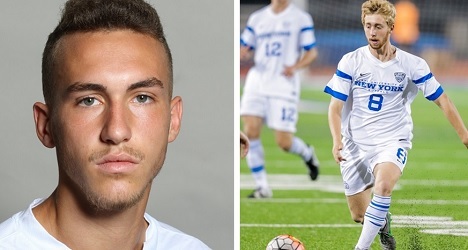 The University at Buffalo freshman had just entered a Big 4 rivalry match for the first time, eager to make an impact in the final five minutes of the first half. Before Bulls goalie Cameron Hogg’s goal kick restarted play, Walsh felt a shove in the back. Startled, he turned to see the aggressor was his older brother, Evan, a redshirt freshman midfielder at Canisius. “I just smiled at him and gave him a little push back,” says Hunter, who admits he didn’t even know his brother was in the game at the time. Seconds later, Hunter sprinted after Evan into the Canisius defensive half, vying for a loose ball -- it was the first time the brothers had ever played competitively against each other. The Walsh vs. Walsh rivalry had begun. The first thing you should know about Evan and Hunter Walsh is that they shared a bunk bed until this year. There are two other siblings in the Walsh family, an older brother, Ethan, and a sister, Lauren, but Evan and Hunter have long been close because of soccer. And, in asking the brothers to talk about each other, it doesn’t take long for the characteristics of a competitive big brother-little brother relationship to emerge. “[Hunter] is taller than me and younger, but he’s not as good [at soccer],” quipped Evan after the Griffs played UB. Responding to the same question after the match, Evan smirked and said slyly, “Oh, hell yeah!”, citing a few text exchanges and then the “welcome to the match” push in the back. Before we get too carried away with the rivalry talk, though, the bond between Hunter and Evan is strong. Each brother does his best to attend the other's home games, schedule permitting -- Hunter's been spotted leaning on the rail at Demske Sports Complex, quietly rooting for his brother to thrive during limited minutes, while Evan attended the Bulls' shutout of Cornell at UB Stadium. Local soccer fans will likely have four more years of Evan vs. Hunter clashes, and, to our knowledge, the duo is the first sibling pair ever to face each other in Big 4 men’s soccer. It's a special relationship, but the differing paths to their current situations is just as interesting. The big brother by 18 months, Evan naturally arrived at athletic achievements first, even if they came from a different sphere of local soccer. Due to their age gap, Evan and Hunter were sometimes together, sometimes apart with Empire United Buffalo through the Under-14 age bracket, when Evan took the next step in the premier path, spending three years with the Empire Revolution Academy ‘96 from 2011 to 2014. For young soccer players in Western New York, there’s no higher level than theEmpire Revolution Academy. The Empire program (a youth development partner of MLS’ New England Revolution) is split into three Empire United premier teams for each age group -- Buffalo, Rochester and Syracuse -- but the best 20 or so players from the three cities represent the prestigious academy team, which plays against youth clubs of MLS teams like New York Red Bulls, New England Revolution and Montreal Impact. The only drawback to making the Empire Academy team is ineligibility to play high school soccer, as a controversial U.S. Soccer rule from September 2012 prevented young athletes from doing both. The academy players still attend high school in their respective regions, but most evenings are dedicated to training, and nearly every weekend from September through November, as well as March and April, is occupied with travel and matches. In Evan’s case, choosing the academy over high school soccer made sense -- he’d already accomplished in two years at St. Joe’s Collegiate Institute what most high school athletes aim for in a full career: junior varsity MVP honors as a freshman (‘10-’11), then a starter’s role for the Monsignor Martin Association champion and State semifinalist as a sophomore (‘11-’12). 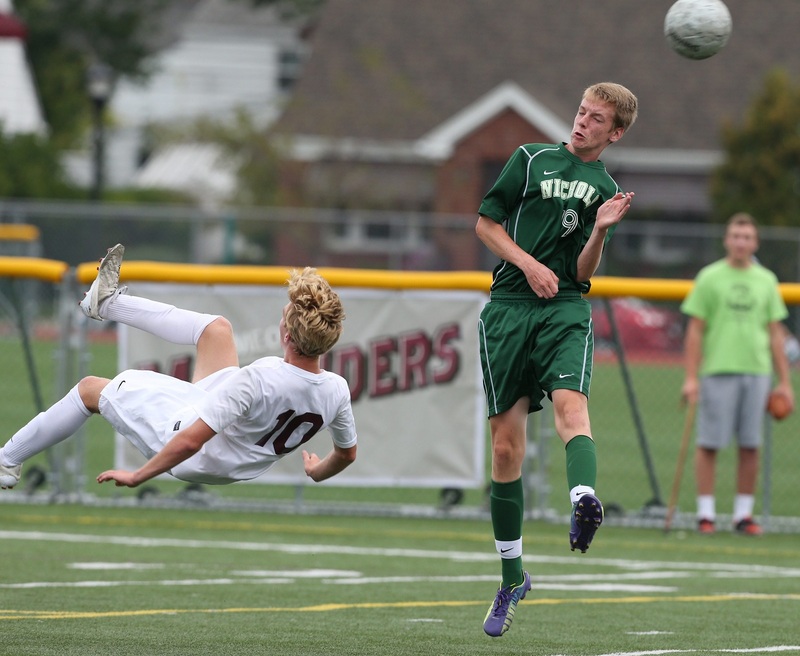 While the individual accolades from playing at the academy were minimal -- Evan was never named to an All-Western New York award list nor captained St. Joe’s as a senior -- the preparation for college soccer, both technically and tactically, was superior at the academy. Not only did he learn to maximize his quickness and one vs. one skills as an outside midfielder, but he became a player hardened by elite competition. 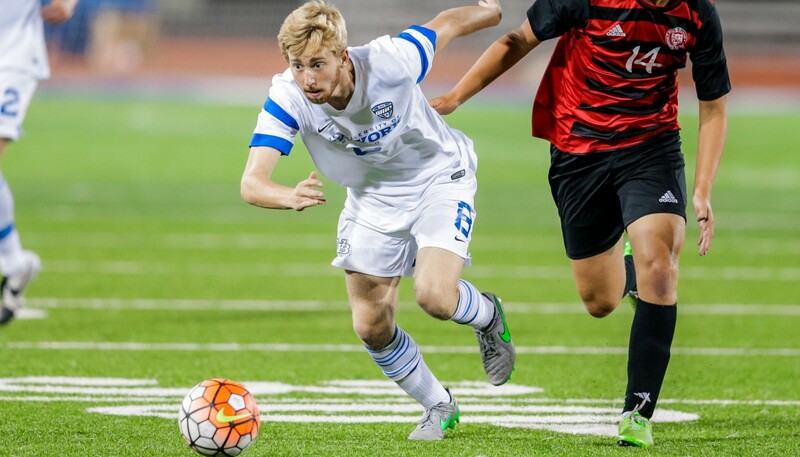 Rising through Empire’s ranks isn’t a foolproof way to get to Division I, but given that academy graduates Alex Bono and Jordan Allen have been called into U.S. national team camps and over 50 others have played Division I soccer since 2008, the process can work, and it did for Evan Walsh, who was recruited to Canisius. 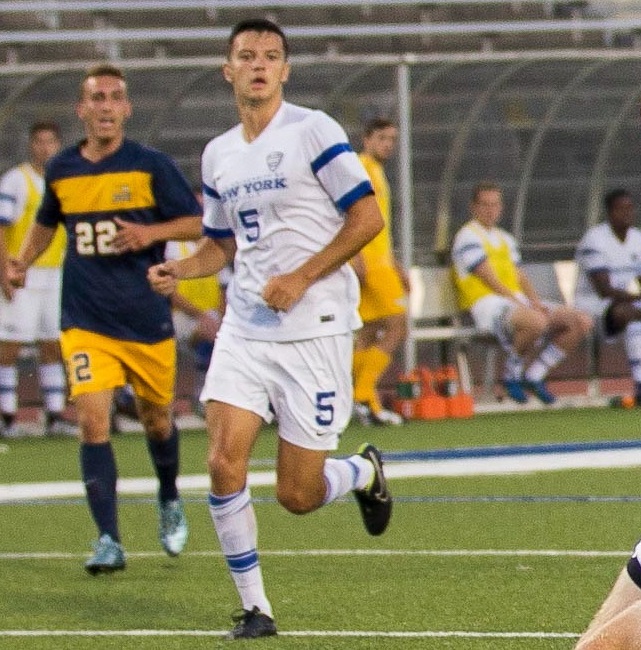 A redshirt year at Canisius further prepared him to contribute for Dermot McGrane’s club, for which he’s now a valuable reserve winger, appearing in all nine matches thus far. "It's amazing how much he's developed since he's been here," McGrane said. "He's really become a valuable player for us." If there’s a recurring theme for Hunter Walsh, it’s that he’s avoided the shadow of his older brother, at times intentionally, other times coincidentally. When Evan made the Empire Academy team, Hunter was left to carry the mantle at St. Joe’s, where he was one of six sophomores on a suddenly depleted varsity squad. In addition to unexpectedly losing Evan, the private Catholic school also graduated three stalwarts named to an All-Western New York team: Julian Olin, Anthony Yarussi and John Vara. Hunter’s first year of varsity under head coach Mike Thoin did not go smoothly, as the Marauders finished a discouraging 5-13-1, punctuated by a demoralizing 4-1 loss to rival Canisius in the Monsignor Martin Association semifinals. To make matters worse, the rival Crusaders went on to win the overall State Catholic Championship, something St. Joe’s hasn’t done since 1995. The down year was quickly forgotten, as the Marauders captured back-to-back MMA titles -- including revenge on Canisius in a semifinal upset in 2013 (Hunter assisted on the game-winner) and again in penalty kicks in the 2014 title game -- as well as twotrips to Long Island for the State Catholic Championships. Fleet-footed Hunter was a major reason for this resurgence; his clinical finishing skills were paired with an unselfish streak -- his 20 goals and 19 assists as a senior showcase the balance -- and unlike his brother, he had the chance to captain his high school team to a league title, earn a spot on the All-Western New York first team and take MMA Offensive Player of the Year honors. The younger brother was also able to develop against higher-level competition for Empire United Buffalo, without sacrificing his high school eligibility. Once his St. Joe’s career ended, Hunter dabbled with the Empire Revolution Academy team, serving as a developmental player on Ben Cross’ ‘97 team as he tried to narrow down his college choice. 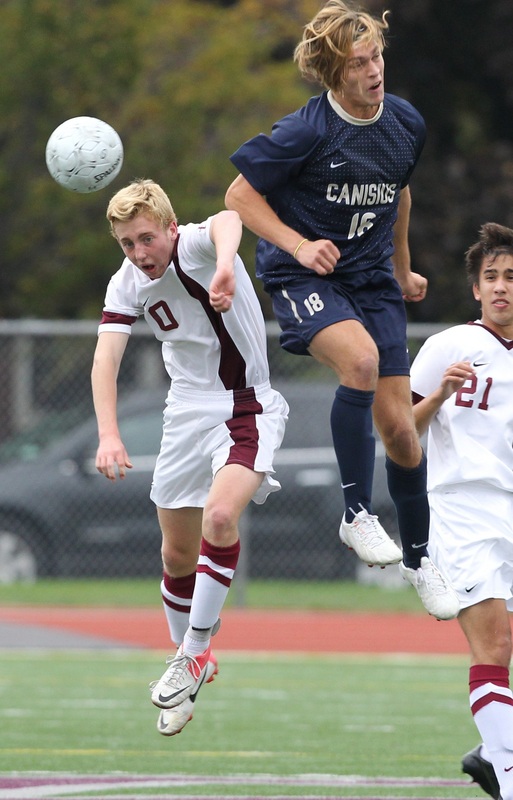 When asked for his opinion of the high school soccer vs. youth academy route, Canisius head coach Dermot McGrane pointed toward the leadership qualities that representing a high-school quality club demands. "Guys from the academy, they're very good players, but they're often the third or fourth best players on their own team," McGrane explains. "They don't get the experience or pressure of leading their high school against rivals or in the playoffs, where they're the ones who must produce for the team to win." McGrane didn't indicate a clear preference in the academy vs. high school question, and he's recently recruited both types -- Walsh from Empire, but also Shane Greene, the Western New York Player of the Year in 2014, from Hamburg High School. Fortunately for college programs, there's plenty of room for talented players like Evan Walsh and seasoned leaders with strong personalities like Greene. Logically, the adjustment period for high school athletes to NCAA Division I may be longer, but it's rare now that an athlete is truly high-school-and-travel only; Empire Buffalo, Black Watch, Global Premier Soccer and the WNY Flash Academy compete for the top non-Academy youth players, all touting advantages in either cost, travel, competition, training or coaches. Only one thing was clear about Hunter’s college choice -- he wasn’t going to Canisius. “Hunter made it absolutely known to all of us that he wasn’t going to follow his brother’s footsteps,” said Debbie Walsh, firmly. Of course, Hunter’s eventual decision to become a Bull wasn’t just because he wanted to be his brother’s rival -- his initial intentions weren’t to stay local, but when the opportunity to play at the University at Buffalo was coupled with admission to the school's honors college, the chance to compete against his brother in front of his family was icing on the cake. The birth of the Big 4 Shield, a wooden plaque awarded to any of the four local schools as a sign of temporary superiority, raised the stakes in the rivalry. Canisius had seized the Shield by beating Niagara in penalty kicks in the 2014 season finale and would have to be beaten by another Big 4 team to relinquish the hardware -- a fact that Evan was quick to remind Hunter when he chose UB. Hunter's head coach, Stu Riddle, admitted that his original plans were to bring his local recruit into the fold in January 2016, as Hunter had enrolled in the honor college and would likely benefit from a semester to acclimate to academic rigors and college life. When Pablo Fernandez-Paniagua Juez, the prized Real Madrid Academy signing, learned he could not attend the university "at the 11th hour," a scholarship spot cleared for Hunter one semester early. "He's still adjusting to the college game," Riddle admits, "but [Hunter] has shown glimpses of a promising college career ahead of him." Three rows of the Walsh’s family and friends -- roughly 15 people altogether -- sat in the section above midfield at UB Stadium. Naturally, Debbie Walsh was a little conflicted, and even slightly unprepared. When asked how she could show support for both of her rival sons, she unveiled a so far unfulfilled plan. “If I had enough time, I was going to get two t-shirts and cut them in half, and then put one on one side and one on the other,” she said. After Evan’s Griffs took the lead early in the second half on a penalty kick, Hunter’s Bulls responded with three unanswered goals, securing a 4-2 win and snatching the Big 4 Shield from the incumbents. While neither Walsh brother saw playing time in the second half, Hunter was eager to rub the result in his brother’s face, a playful repayment for the off-season trash talk and mid-game push. Albeit a little subdued after the defeat, Evan cracked a smile when asked about his brother before explaining that the family was going out to dinner after the match.